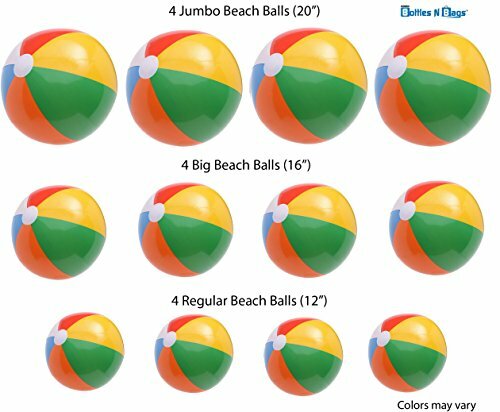 Variety pack contains 4 each of 12" (regular), 16" (big) and 20" (jumbo) rainbow beach balls for 1 dozen total. Keep the kids occupied with these fun toys, perfect for indoor or outdoor use. Sizes are approximate. Have fun playing in the pool with enough beach balls for the entire family! If you have any questions about this product by Bottles N Bags, contact us by completing and submitting the form below. If you are looking for a specif part number, please include it with your message.